This is a list of women chemists. It should include those who have been important to the development or practice of chemistry. Their research or application has made significant contributions in the area of basic or applied chemistry. Five women have won the Nobel Prize in Chemistry (listed above), awarded annually since 1901 by the Royal Swedish Academy of Sciences. 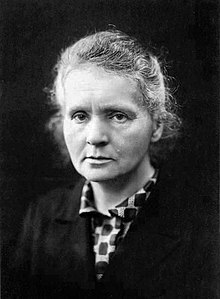 Marie Curie was the first woman to receive the prize in 1911, which was her second Nobel Prize (she also won the prize in physics in 1903, along with Pierre Curie and Henri Becquerel - making her the only woman to be award two Nobel prizes). Her prize in chemistry was for her "discovery of the elements radium and polonium, by the isolation of radium and the study of the nature and compounds of this remarkable element." Irene Joliot-Curie, Marie's daughter, became the second woman to be awarded this prize in 1935 for her discovery of artificial radioactivity. Dorothy Hodgkin won the prize in 1964 for the development of protein crystallography. Among her significant discoveries are the structures of penicillin and vitamin B12. Forty five years later, Ada Yonath shared the prize with Venkatraman Ramakrishnan and Thomas A. Steitz for the study of the structure and function of the ribosome. Fanny Rysan Mulford Hitchcock (1851-1936), one of thirteen women to graduate with a degree in Chemistry in the 1800s, and the first to graduate with a doctorate in Philosophy of Chemistry. Her areas of focus were in entomology, fish osteology, and plant pathology. ^ "Nobel Prize Awarded Women". www.nobelprize.org. Retrieved 2016-04-18. ^ Creese, Mary (1998). Ladies in the Laboratory? American and British Women in Science, 1800-1900: A Survey of their Research (1st ed.). Lanham, MD & London: The Scarecrow Press. p. 256. ISBN 0810832879. This page was last edited on 16 February 2019, at 01:03 (UTC).